The first book in this series, Self-Therapy, brought Internal Family Systems Therapy (IFS) to both therapists and the general public. IFS is a powerful and user-friendly method of therapy, which can be done on your own. Self-Therapy, Vol. 3 shows how IFS can be used to transform a variety of important psychological issues. You don’t need to have read Vol 2. 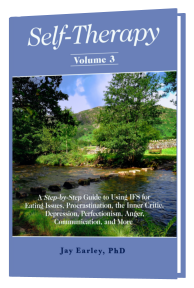 If you have been using IFS with your clients or in your own inner work, this book will help you to heal and transform eating issues, procrastination, the inner critic, depression, perfectionism, anger, communication, and more. Jay Earley, Ph.D., is a licensed psychologist, psychotherapist, group leader, author, teacher, web entrepreneur, and theorist. He is a big-picture thinker and innovative psychological theorist. Jay isknown the clarity of his teaching and writing, his creative methods ofdemonstrating complex ideas, and his detailed description of therapeutic technique. Jay focuses on Internal Family Systems Therapy inall aspects of his work. He teaches courses applying IFS and thePattern System to specific psychological issues such as procrastination, communication, relationships, and the inner critic. Jay has publishedother books on IFS, including Freedom From Your Inner Critic, ResolvingInner Conflict, and Working Through Anger in IFS. Seepersonal-growth-programs.com. Jayhas created the Pattern System, a systematic approach to understandingyour personality that can lead directly to psychological healing andpersonal growth. He has published a series of books based on the Pattern System. See patternsystem.com. Jay has createdSelf-Therapy Journey, an online tool for exploring and resolving a widevariety of psychological issues and developing healthy capacities. Seeselftherapyjourney.com. Dr. Earley isnationally known for his innovation in the group psychotherapy field,published in Interactive Group Therapy: Integrating Interpersonal,Action-Oriented, and Psychodynamic Approaches. He continues to leadinteractive and IFS therapy groups in the Bay Area.Jay has also published Transforming Human Culture: Social Evolution and thePlanetary Crisis and Inner Journeys: A Guide to Personal and SocialTransformation. He is a former computer scientist. I am a psychotherapist of 30 years, specializing in treatment of trauma and anxiety. Discovering the work of Richard Schwartz (Internal Family Systems) added clarity and additional components to my work. Utilizing IFS has made me a more effective therapist. The work of Jay Earley has taken the theory and made it more applicable to both me and my clients. Not only did I gain skills and knowledge reading Self-Therapy, but recommending to my clients augments my work and helps my clients “get” IFS. I highly recommend this and all of the work of Dr. Jay Earley. Having been a clinical psychologist for the past thirty years, I was very excited to have discovered the power of Internal Family Systems work. Jay’s books have helped make IFS very clear and easy to learn. In his recent book, Jay has taken several common, but difficult problems (procrastination, self hatred, eating disorders) and helped the reader apply IFS theory to them. HIs writing is very clear and engaging and he is a joy to read. I highly recommend this book to all those who are interested in learning IFS.